A magical spot like this deserves to have a legend and Kuntala falls happens to have one. It got its name after Shakuntala, the beloved wife of King Dushyanth. Legend is that they fell in love with each other somewhere around these falls and were mesmerized by the scenic beauty of the surroundings. It is also believed that Shakuntala used to bathe by the waterfall. Kuntala falls is situated on Kadem River in Neredigonda mandal. 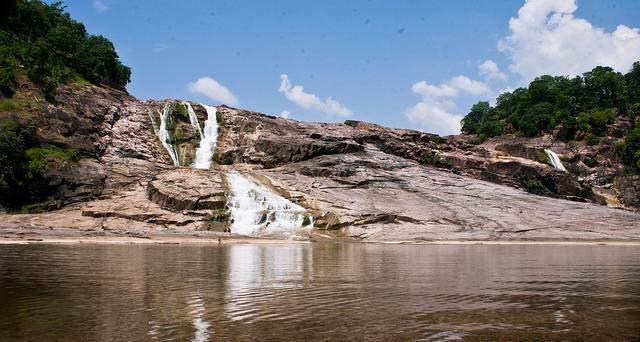 It is the highest waterfall in the state of Telangana with a height of 147 feet (45 meters). Monsoons and post-monsoons are the best seasons to visit Kuntala Falls. Although, keep in mind to be careful while giving in to fun as it might be dangerous to get into water at the bottom when the water flow is high due to sharp rocks and twists. You work through a ridiculously hot day, sweating from every pore of your body and are in real need for some determination to carry on. A memory of the time you visited Kuntala waterfall will take you through- this is the power the beauty of this place has. Unless you have hydrophobia or are not fond of waterfalls, there is no reason why you shouldn’t visit the Kuntala fall.